Canadian fireworks regulations rank among the highest standards in the world. All members are required to abide by all Canadian Regulations. This includes Federal, Provincial and Municipal laws (related to fireworks) and all other related governing bodies such as Transport Canada. Members are required to practice and promote the safe sale and use of fireworks to their customers and shall not participate in any activity, directly or indirectly that would negatively affect the fireworks industry. 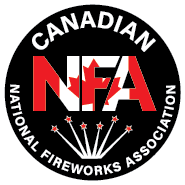 The CNFA represents all aspects of the Canadian fireworks industry and the slander or defamation of any industry members or member agencies is not tolerated. Directors, Chairs, and Committee members will act ethically with integrity and professionalism. Members must represent unconflicted loyalty to the interest of the association at all times meaning that personal and/or business interests must not interfere with the progress of any committee, project or the organization as a whole. We are a not-for-profit association, any funds generated by donation or the purchasing of CNFA products will be used solely to fund the association. It is our policy that no member shall derive any personal profit from services provided to the association. We encourage participation and collaboration from all aspects of the industry. This includes but is not limited to; major distributors/importers, retailers, enthusiasts, Fire Departments/Associations and regulatory bodies.